Lakeshore Family Guide - Winter Fun in West Michigan - Ludington, Manistee, Pentwater and more! There's no need to hibernate during the winter months in West Michigan--not with all the great outdoor activities that use the snow for fun! Read our story for ideas, then bundle up and enjoy the many things you can do in our West Michigan winter wonderland! Traveling west on US-10 through Ludington, turn right on Lakeshore Drive/M-116 and drive north until you reach the Ludington State Park. Eight miles of trails are open to winter enthusiasts, with the Logging Trail offering two shelters. This is a very popular place to cross country ski and snowshoe. The park even hosts workshops for making your own snowshoes. A State Park sticker or the purchase of a day pass is needed to enter the park. Take the Monroe Rd. exit off US-31, turn west on Long Bridge Rd. and south on Wayne Rd. Entrance is about one mile south. Nearly 15 miles of well-marked trails that loop through marshes and woodlands. Snowshoers are requested to travel beside the trails rather than on them. Read our Pentwater Pathways story for more information. From Wellston in the heart of Manistee County, take M-55 west four miles to E. Udell Hills Rd., then turn south for three miles to entrance. This cross country ski trail winds through the Manistee National Forest, with groomed trails covering over 18 miles. There is no cost to use the trails. Take either the Hart, Shelby, New Era, or Rothbury exits off US-31 and follow signs. Popular in the summer for biking, this 22 mile trail stretches from Hart to Montague, with trailheads in each of the towns in between. Most of the trail is flat with long, straight stretches. 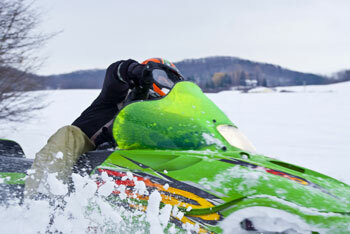 If there is more than four inches of snow on the ground, the trail is open to snowmobiles. More details can be found in our Hart-Montague Snowmobiling story, along with information about nearby Silver Lake Sand Dunes. Take the Monroe Rd. exit off US-31, turn east and travel until you reach 126th Ave. When it turns into Jefferson Rd. turn north back onto 126th, travel just over a mile to River Rd. and turn east. Located in a remote section of the Manistee National Forest, this is a fairly new trail, which makes up two tracks over four miles. Just the opposite of the Hart-Montague Trail, this is anything but straight-traveling around curves and over uneven ground. Those on snowshoes should travel beside the trails rather than in them. If you don't own your own cross country skis, you can rent some at Provisions Sport Shop in downtown Ludington. They carry many varieties of equipment, and are open 10am-5:30pm. 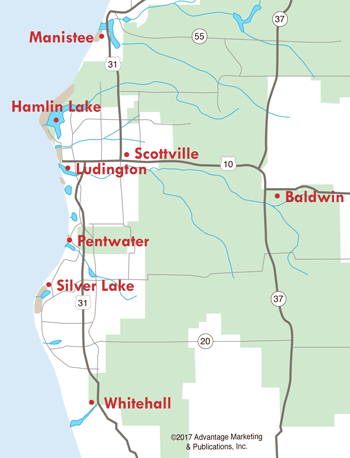 The closest downhill skiing resorts are within an hour and a half from Ludington. 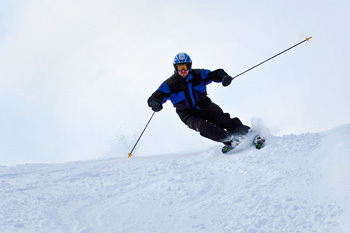 Both offer lodging, ski packages, programs, and special activities. Follow US-31 north out of Manistee for 21 miles, then turn east on County Rd. 602. Travel seven miles to M-115, turn west into entrance. Voted #1 Resort in the Midwest by SKI Magazine. Featuring 45 slopes, plus more than 40 kilometers of cross country ski trails. Crystal Mountain offers ski & snowboard schools, horse-drawn surrey rides, ice skating, bonfires, and moonlight hikes. There's also a nice variety of lodging facilities, and the brand new Crystal Spa. Out of Ludington, take US-10 east to Baldwin, and turn north on M-37. Follow until you reach M-55 and turn east, then left into entrance. Enjoy the relaxed, family-friendly atmosphere at Caberfae Peaks, featuring 34 runs that offer big vertical drops. Their day lodge has a cafeteria and bar, and overnight lodging is available, with an outdoor heated pool and spa. Very economical specials are available, including Family Fun Sunday, Ladies Day and College Night. 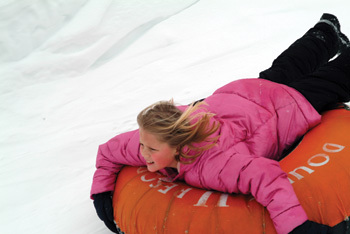 For fun in the snow with just your sled or toboggan, try your luck at various hills and dunes within the Ludington State Park, or Water Tower hill on South Staffon and Melendy Streets in Ludington. If you just can't handle the cold, there are great indoor activities, too. Indoor fun includes making a splash in a heated swimming pool, gliding around an ice arena, working out in a fitness center, seeing a performance or a movie, going out on the town, and so much more! We're blessed to have the West Shore Community Ice Arena, across from the Rec Center at West Shore Community College. Throughout the week, they have open hours for ice skating, providing a fun and safe activity for people of all ages. Open Swim, Saturday and Sunday, 6-8pm. Call (231) 845-5543 for open hours. There are a variety of bars in West Michigan, many of which offer live entertainment on weekend nights. If karaoke is what you're looking for, you'll find that, too. Good friends and good times last long into the night...with taxis available for safe rides home. See: Ludington Entertainment, Manistee Entertainment and Pentwater Entertainment for additional ideas. You can always rent a movie at Family Video---or choose from one of eight movies currently showing at AMC Classic Ludington 8 on US-10. In Manistee, be sure to visit the newly renovated, historical Vogue Theatre for great prices on current movie tickets and concession items! Don't wait for summer---enjoy all that winter has to offer here in beautiful West Michigan!